Apologies for my slight absence from the world of WordPress; these past few weeks have flown by in a haze of portfolio collating, CV construction and interview excitement as I search for a new job – which I am delighted to say has paid off. I’m grateful to have finally found some time for my own writing again and thought I’d share with you my thoughts on the wonders of ancient stone circles. This may immediately make a lot of people think of Stone Henge (the most famous of all) but of course that particular wonder is a tad mainstream for me! 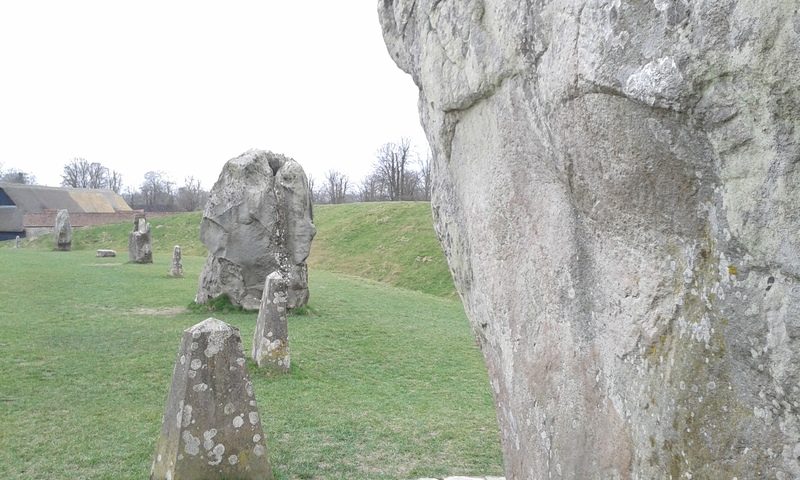 Instead, I had the absolute pleasure of travelling to Avebury – a wonder that has been left undeveloped and unspoiled; with stone circles just as ancient and just as mysterious as its more famous cousin. Avebury is like seeing a band you really love, who are not big enough (or choose not) to perform at larger venues. Instead they pack out a small, intimate venue and perform great music without the hassle of getting in and out of a huge arena or paying a fiver for a drink. Avebury is definitely akin to the small band; with parking only costing three pounds for the day, no high tech visitor’s centre and no fence holding you back. This means that one can walk right up to and touch the enchanting stones, which have remained unmoved for well over ten thousand years. To think, that I walked among a man built formation that has witnessed Pagans, Romans, Saxons, Normans, Tudors, Stuarts and many more ruling dynasties, is simply marvellous. One can only wonder who else has walked this path and touched these stones over the past millennia. No one really knows for what reason the stones at Avebury were laid, it is this mystery that makes them so exciting to experience. Avebury, like Stone Henge, maintains a spiritual significance for many people today; especially among groups such as Pagans and Druids. Across the site (which extends for many miles beyond the village) there are signs of this spiritual power, with one old tree in particular adorned with ribbons and other charms. Though the spectacle of a more famous landmark (or larger concert for that matter) certainly makes for an amazing experience, it is often the smaller ones that make for those memories most special. We can feel as if we are part of the performance, or truly embracing our surroundings – whether a talented little band is playing our favourite song or an ancient stone circle is enchanting us with its mysteries. I’m with you on this. Avebury is beautiful, and the fact that the stones are just there, where you can walk among them, lean against them, touch them, makes it far more touching than Stonehenge, impressive as it is. Precisely! The fanfare of bigger attractions can be a great experience, but lesser known ones like Avebury just feel so much more personal.